Please share this with any teachers you know. Dr. Marable was very important to me, and I can think of no greater tribute to him then to share his work so that it inspires new social critics. I have written a curriculum to to support the project, which you can find here. “Along The Color Line”, written by the late historian Dr. Manning Marable, was a public educational and information service dedicated to fostering political dialogue and discussion, inspired by the great tradition for political event columns written by W. E. B. Du Bois nearly a century ago. This video contest provides high school students with the opportunity and incentive to use scholarly research to analyze and pose solutions to some of the social issues that Manning Marable addressed in his writings such as sexism, racism, imperialism, and poverty. It continues the spirit of “Along the Color Line” by fostering critical analysis on political issues and public events that had special significance to African Americans and to other people of color internationally; allows students the creative license to translate the rigorous research that Dr. Marable used in his “Along the Color Line“ columns into a creative and accessible video medium; and empowers students to speak out about the material conditions of their lives to an audience of teachers, activists and community members at “A New Vision of Black Freedom: The Manning Marable Tribute Conference” sponsored by Columbia University’s Institute for Research in African-American Studies from April 26 – April 28, 2012. Curriculum Connection: An adaptable weeklong curriculum developed by a NYS certified HS teacher is available free for educators. It provides educational units and background reading for teachers of Civics, Government and US History to connect this contest to their classroom while meeting several Common Core writing (1,4,5,6,9) and reading (1,2,4,6,8,9,10) standards. 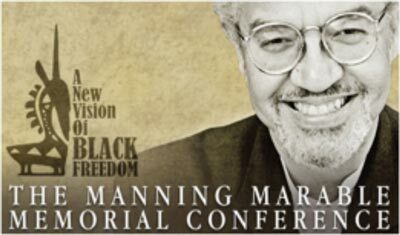 Contest Requirements: After becoming familiar with Manning Marable’s column “Along the Color Line” style of blending scholarly data with political analysis to address social issues, students will create a 2-3 minute long video presentation that features their research and analysis of a social issue that is important to them and their community. Criteria: This contest is limited to students currently enrolled in high school anywhere in the US. Submissions will be judged on depth of knowledge of social problem being discussed, originality, and creative expression. Students can submit individually or through their teacher as part of a class project. Submissions: The due date is February 17, 2012 before midnight. Submissions should be sent to marablevideocontest@gmail.com. Only one submission per email and per student. Students must include their name, age, grade, and full contact information as well as the name, address and phone number of their high school. Videos longer than 3 minutes will not be accepted. Finalists: The top finalists will be special guests of the conference, where their videos will be screened. The first place winner will be announced at conference. Prize: $250 Prize, one of Dr. Marable’s books and the video featured on the conference website.